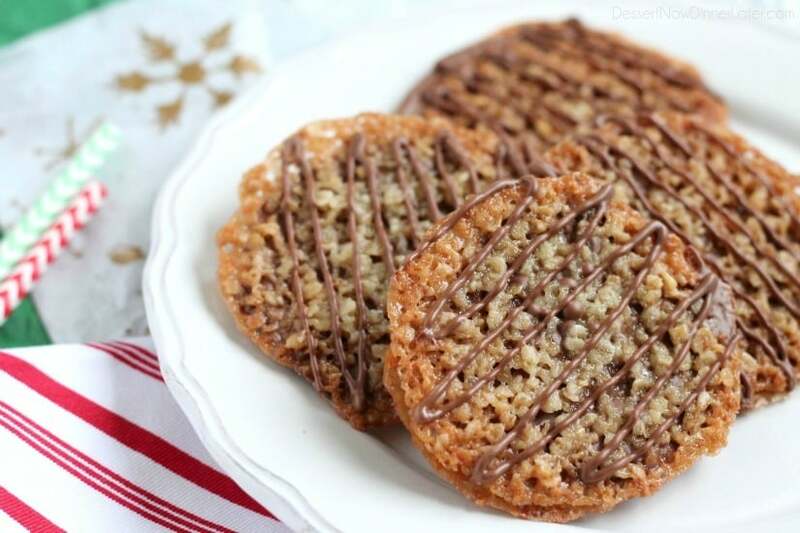 Oatmeal Lace Florentine Cookies - Dessert Now, Dinner Later! Thin, crisp, buttery cookies are sandwiched between melted milk chocolate with an extra chocolate drizzle on top. They taste like toffee and they look like lace. 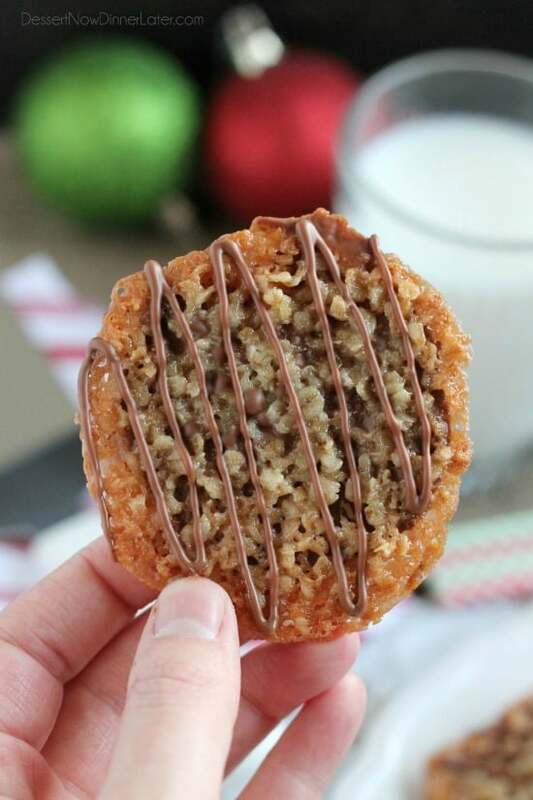 These Florentine Cookies are a holiday favorite! 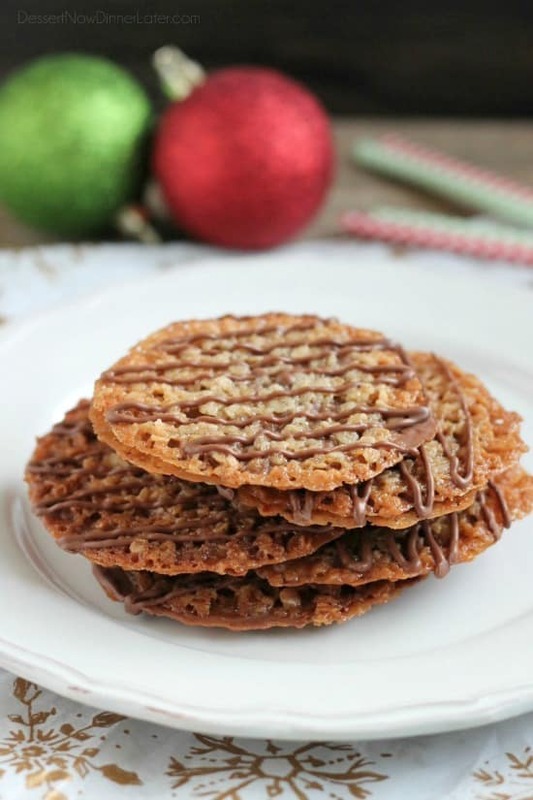 A couple of Christmases ago, my mother-in-law bought a container of lace (Florentine) cookies from Costco and we were all dying over how delicious they were! So I thought it would be fun to try and make them at home this year. They are pretty dang easy and so delicious! 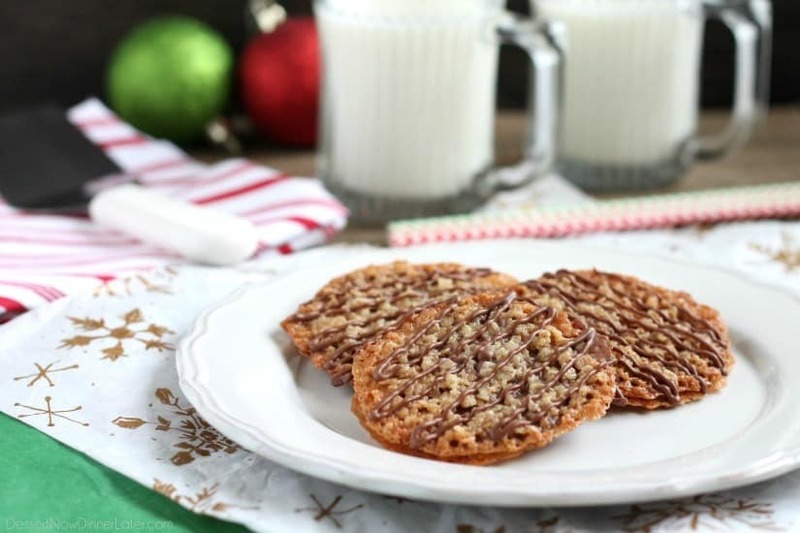 Traditional lace cookies are made with almonds, and since these are made with oatmeal, I will call them the poor man’s Florentine cookie because quick oats are much cheaper than almonds. You can’t really tell they are “oatmeal cookies” though because they are just crisp, sweet, and buttery. Almost like toffee, with a caramelized taste. You can eat these plain or fill them with chocolate, which is how I prefer them. You can even see some of the chocolate peeking thorough the holes in the lace cookies. So delicious! The original recipe I used made 84 cookies (42 sandwiches) and took me literally 2 hours to bake and assemble, so I have cut the recipe in half for you because who needs 42 sandwich cookies? I mean, we ate them all, don’t get me wrong, but I wasn’t planning on spending that long in the kitchen baking one type of cookie. 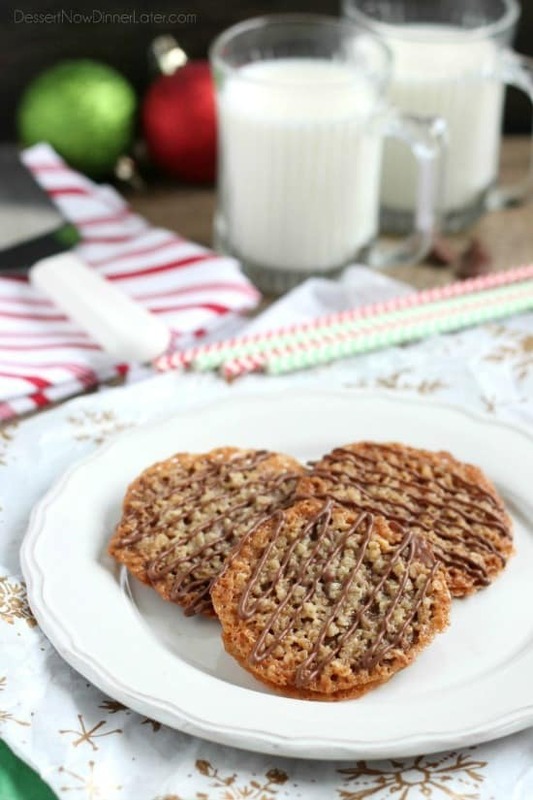 If you want to try something truly unique and delicious this holiday season, give these lace (Florentine) cookies a go! You will be surprised at how much you like them! Melt the butter in a saucepan on the stovetop. Remove from heat. Add the oats, sugar, flour, corn syrup, milk, vanilla and salt. Stir until combined. Line baking trays with a silicone baking mat, parchment paper, or heavily greased foil. Drop 1 tsp (Yes, 1 teaspoon!) of cookie batter 3-inches apart on the tray; about 6 to 8 cookies per baking sheet max. (They spread like crazy!) Lightly grease the back of a spatula and flatten the center of each dollop of cookie batter. Bake at 375 degrees Fahrenheit for about 5-7 minutes until golden brown. Allow to cool slightly before transferring to a cooling rack. Heat chocolate with the coconut oil or shortening for 20 second bursts in the microwave, stirring between each 20 seconds, until melted. Spread melted chocolate between two cookies. Repeat with remaining cookies. 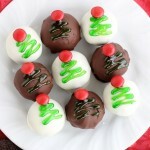 Put the leftover melted chocolate in a zip-top bag, cut off the corner and drizzle the tops of the cookies. Allow chocolate to set completely. Store in an airtight container up to 5 days. 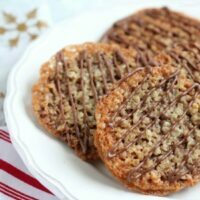 I love soft baked oatmeal cookies, but these are just thin and crisp that you don’t get the texture of oats, but a crisp toffee like texture. I’m glad you think the oatmeal sounds fine though. 😉 Thanks Jess! 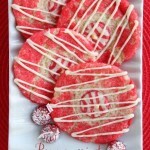 I have never made lace cookies, but now I have them on my short list to try! Pinning! You will love them! 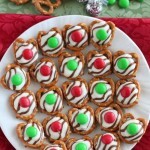 They are a real treat around Christmas time! Thanks for stopping by Carlee! Amber, these look so good! 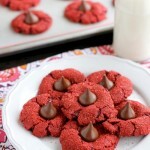 I’ve never had a homemade lace cookie and I’ll have to try these! They are really unique and delicious. I don’t like crisp cookies, but these are thin and toffee-like, so I’m in love with them. I am sure you would like them! hi, these cookies are just so delicious and definetely worth a try however i wish to ask if there is any alternative for corn syrup that i can use as i prefer not to use it. Yes! You should be able to substitute the 2 Tablespoons of corn syrup with 2 Tablespoons of sugar dissolved in 1 1/2 teaspoons of really hot water. Good luck! HI…can you use large flaked oats instead of quick oats? Thank you. The texture/look will be different. You may want to pulse them a few times in the food processor first. But I think they should be ok to use. They are so good. But You might want to do a year cookie. 8 minutes was way to long in my oven. I actually had to bake for 4 1/2 minutes. Mine were just a little bigger too. They wernt hard to make at all. The trickiest part was the time spent in oven. And YUMMY doesn’t even begin to describe them. Crunch chewy toffee chocolateyness!! Oops…I hate spell check. It should say do a test cookie. Good to know! I’ve adjusted the recipe to have a time range. I typically keep an oven thermometer in my oven, but everyone’s ovens are so different. I definitely don’t want anyone burning them though, so thanks for the heads up! Unfortunately, due to the delicate nature of this cookie, they are very likely to break if frozen. I wouldn’t recommend freezing them. Can you use regular oats instead of quick oats?? And anyone have a length of shelf life? I do a lot of baking for Christmas and I’m wondering where to put this in my schedule. Thanks! If you use regular oats, I would pulse them in the food processor to break them up a little bit first. These should last up to 2-3 weeks in a loosely covered container.